This powerful photo taken by Robert C. Wiles was published as a full-page image in the 12 May, 1947 issue of Life Magazine. It ran with the caption: “At the bottom of the Empire State Building the body of Evelyn McHale reposes calmly in grotesque bier, her falling body punched into the top of a car“. Evelyn McHale is probably the most famous Empire State Building suicide victim. The young and pretty Evelyn leaped from the 86th-floor observatory in 1947 and landed on the roof of a United Nations limousine parked on the street below. Her calmly elegant demeanor, her legs crossed at the ankles, the way the car’s metal folded like sheets and framed her head and arms—perhaps these were the reasons that McHale’s death was given its title as “The most Beautiful Suicide”. When she died, she was still wearing her pearls and white gloves. Born September 20, 1923 and one of seven siblings, she was a child in Washington D.C. when McHale’s mother left the household and her parents divorced. Her father, a bank examiner, retained custody of all the children. After high school, McHale became a WAC, stationed in Jefferson, Missouri. She made her way to New York City where she worked as a bookkeeper and lived quietly with her brother and sister-law in Baldwin, Long Island. She met her fiance Barry Rhodes, a Pennsylvania college student just discharged from the Air Force, and was a bridesmaid at the wedding of Rhodes’ younger brother. Around 10:40 am Patrolman John Morrissey, directing traffic at Thirty-fourth Street and Fifth Avenue, noticed a white scarf floating down from the upper floors of the building. Moments later he heard a crash and saw a crowd converge on 34th street. Evelyn had jumped, cleared the setbacks, and landed on the roof of a United Nations Assembly Cadillac limousine parked on 34th street, some 200 ft west of Fifth Ave.
A photography student across the street, Robert C. Wiles, heard the loud crash of her body hitting the metal, and ran over too. Fortuitously, he had his camera and took a photo of her as she lay on the roof of the crumpled car. It was snapped just four minutes after she died and, despite the 1050-foot fall (320 m), her body looked intact. Remarkably Evelyn shows absolutely no evidence of trauma and appears disarmingly placid and composed – as if asleep. Around her, however, the crumpled sheet metal and broken glass show the violent destructive evidence of her jump. This apparent juxtaposition is what makes Wiles’ image so arresting and memorable. Some 60 years later it remains a haunting and affecting piece of photo-journalism. “I don’t want anyone in or out of my family to see any part of me. Could you destroy my body by cremation? I beg of you and my family – don’t have any service for me or remembrance for me. My fiance asked me to marry him in June. I don’t think I would make a good wife for anybody. He is much better off without me. Tell my father, I have too many of my mother’s tendencies”. 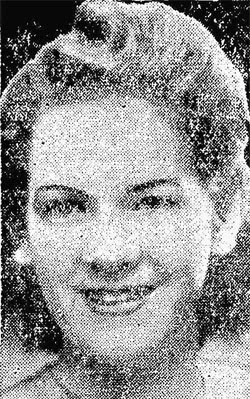 Her body was identified by her sister Helen Brenner and, according to her wishes, she was cremated. There is no grave. Since the Empire State Building was constructed in 1931 some 36 people have jumped from the building, including 17 from the 86th floor observation deck. Evelyn was the 12th suicide from the building and the sixth to clear all of the setbacks. She was one of five people in a three-week period to attempt suicide from the observation deck. In response a 10-ft wire mesh fence was installed and guards were trained to spot potential jumpers. After the barrier was installed people just jumped from other parts of the building, usually from office windows.